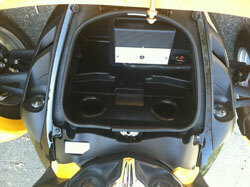 Don't think you can put a nice system on a motorcycle...think again! 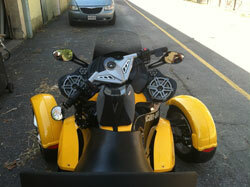 We have more experience with motorcycles than most shops in the area. We have installed systems on a vast array of motorcycles from Harley Davidsons to Honda Goldwings to sport bikes and even the new Can-Am three wheel bikes. 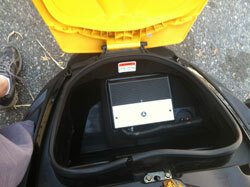 We can connect iPods and smart phones with streaming audio, and create a sound system that you would never believe was coming from a motorcycle. With the new advances in technology, some of the best manufacturers have improved speaker cone materials and micro-powered amplifiers that will fit anywhere and are very water resistant. They also draw very little power from the motorcycle system unlike the older technologies that were hard on the batteries. 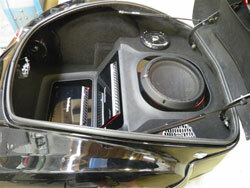 For the Harley Davidson lover, Rockford Fosgate now has a 2-channel or 4-channel system designed specifically for model years 1998-2013 and includes a matched amplifier and speaker set, amp mounting plate, and wiring harness. Why not customize your bike with LED lighting. With the new LED technology, the lighting systems are thinner, brighter, and more reliable then ever. They are very efficient and do not require the high voltage such as the old neon technology. And don't forget to upgrade your headlights to the new LED versions for those dark back roads and country cruises. No need to worry about where you park your bike, it will always be safe. We can install an alarm system with digital tilt sensors, tracking systems, paging systems, and even systems that can connect to your smart phone. So cruise on in to The Audio Connection so we can help you customize and excite your ride.